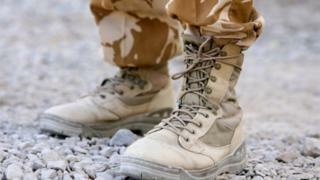 A UK soldier has been killed in combat in Syria, the Ministry of Defence has said. The serviceman - embedded with US forces as part of a counter-terrorism operation against the Islamic State group - was killed on Thursday by an improvised explosive device. An American soldier was also killed by the roadside bomb, US officials said. The MOD confirmed that his family had been notified, adding "our thoughts are with them at this difficult time". BBC defence correspondent Jonathan Beale said the British serviceman is the first UK soldier to be killed in combat fighting IS. He said: "The MOD and the government has not acknowledged that British forces are involved in combat in Syria before. "They never comment on the activities of UK special forces either. But in 2017, the then Defence Secretary Michael Fallon did tell MPs that a small number of UK military personnel had been in the country as part of the US-led coalition." Our correspondent added it was believed the serviceman was killed near the town of Manbij in northern Syria in a night-time operation against IS. US officials said five other personnel were wounded in the incident. It comes a day after US President Donald Trump told advisers he wanted US forces withdrawn from Syria "very soon".